As with most things in the universe, we have come to expect the unexpected. Pluto’s moons are no exception. 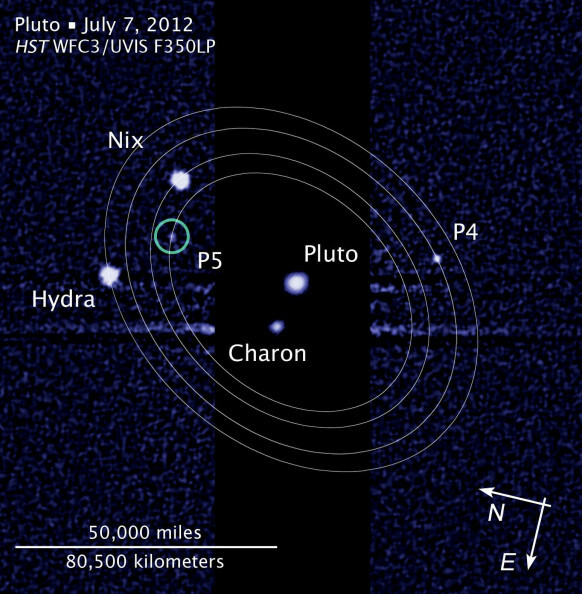 The Hubble Space Telescope has sent back amazing images of two of Pluto’s moons, Nix and Hydra, which shows that they are in a constant state of wobbling, and moving around the dwarf planet unpredictably. Astronomers concluded that this is the result of these two moons orbiting both Pluto and their other partner planet Charon. Before Hubble sent these photos back, it was thought that Pluto’s four smaller moons moved around the dwarf planet as the other planets in our solar system do, in a smooth, circular pattern. One additional reason for the moons wobble has to do with the fact that they are not spherical like most planet and moons, but rather more of an oblong football shape. Astronomers believe that other moons, Kerberos and Styx, have similar situations. Thanks to NASA’s New Horizons spacecraft, we will be getting our first close-up look at Pluto and its wobbly siblings in the next month. Pluto’s other two moons are named Kerberos and Styx, which keep with the underworld naming convention as opposed to the more commonly thought of Disney character. The name Pluto was the name of the ruler of the underworld in classical mythology.